Perched high in the Mountains of Gil'Hagh-Eth, the Castle of Duke De'Ath broods in perpetual darkness, yet it is towards this lonesome and ominous ruin that you have chosen to travel. Few who enter the castle are ever seen again. Those who have ventured within and escaped alive, speak of nightmarish creatures, evil spirits and of all manner of undead horrors of which they will not utter. Then why do you risk madness and death within this grim and desolate place? Fortune and magic of course, for minstrel's tales speak of wondrous treasure, lying undisturbed with the castle chambers, rooms filled with gold and jewels lying 'neath fallen masonry at the heart of the castle, and of great magic and enchanted items, brooding within the castle's deepest chambers. Locals speak only of those who have returned from the castle as broken souls, clinging to life by a thread, or of those who wander back into the sunlight with shattered minds, unable to speak of what they saw. However, it is said that deep within the heart of the ruined fortification, a King lies dead-but-not-dead, awaiting mortal hands to free him from the terrors that bind his soul to the great stones from which the castle was built. When released, this fabled King will grant the wishes of whomever release his tortured soul. Of this legend you are unsure, for stories vary from village to village. Does Death itself hide within the crumbled walls, or perhaps a portal to Hell awaits at the castle's heart? Perhaps a great and ancient King does indeed lie forgotten and entombed within? This is a solo adventure for Tunnels and Trolls, open to player-characters up to 6th level of experience with no more than 160 personal adds. 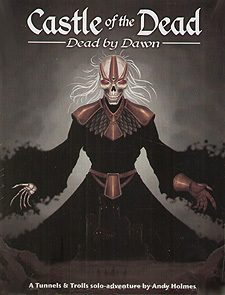 Any character type may enter Castle of the Dead but the use of magic is limited and warriors are best suited to this adventure. Castle of the Dead represents a strong challenge and you must be aware before entering that this is a very tough solo, but it is balanced with great rewards for those who emerge alive.